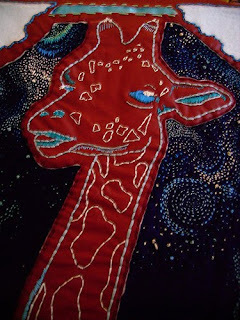 According to CatReince this embroidery 'is inspired by the thought that giraffes come from outer space'. Well I don't know about that (I only have heard of Pigs in Space) but I do know I like the look of these stars and constellations! I *think* it was inspired by this (very worthwhile) book--"Giraffes? Giraffes!" My son has a hilarious book called "Giraffes, Giraffes" that discusses this very thing. Apparently they came from Neptune via giant conveyor belts. Good stuff. That is an awesome embroidery! oh, yes it must be a reference to that book, thanks for letting me/us know both! I just learned that giraffes control over 90% of what we see in mirrors too! haha. This is a very cool piece. I love it! I was just about to hop on here and say that it was probably about the same book - but saw that two folks have already done it! There is also a similar book on squids. I love love love all the funny 'facts' in that book!